I got an excellent question last week on the ask my answers page that brought me new understanding of DAX. So finally a new interesting (I hope) blog post on DAX. Why are you using AVERAGEX instead of the regular AVERAGE function? Are you trying to do an average of weekly totals? 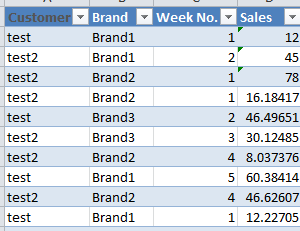 Sales[Week No] before doing an average. I tried to do this moving average with power bi and it doesn’t work. Basically, I tried to do many time different commands from Internet for moving average in DAX and it doesn’t work. What could it be? and it says "A single value for column 'consumption' in table 'input' cannot be determined. This can happen when a measure formula refers to a column that contains many values without specifying an aggregation such as min, max, count, or sum to get a single result." You should create a measure, not a column. That should do it.